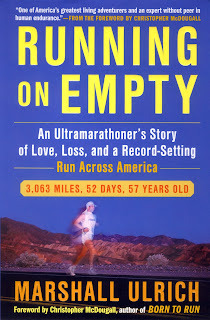 For our February blogger book club (to be discussed on February 11), we read "Running on Empty" by Marshall Ulrich. He is an ultramarathoner who took up running for the same reason that a lot of us have... to cope. As stated above, Marshall took up running when his first wife was dying of cancer and he was struggling to cope with the reality of it all. I can understand that. I mean, I run to clear my head. I (thank goodness) have not had to deal with such tragedy in my life so far, (and I hope not to for a VERY long time!) but running really is my therapy these days. And I hope that it continues to be that for me. 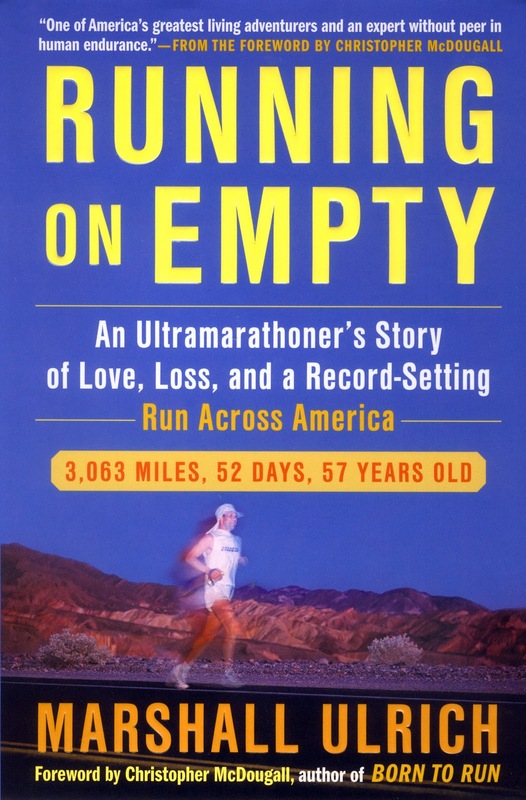 He touches on various experiences that he had (running the Badwater Quad - which is the Badwater ultra - 135 miles - 4 times back to back), 24 hour races and setting world records during them, the Leadville 100 (which you read a lot about if you have read "Born to Run") but the largest portion of this book is focused on his run across America. That is 3,063 miles across all kinds of terrain. A large portion (probably 3/4) of this book is dedicated to this race. Marshall decided that he wanted to do this, and break the world record doing it. With a lot of work, he found a partner in crime for the race, a team to help him with all of the logistics of running and help him with massage, supplies, and injuries, and there was even a team to film their adventure across the country for a documentary. It follows each state that he runs through across the country, how many miles he has covered and has left to go, what day it is when he enters the state, etc. I enjoyed reading about all of his progress. I felt like he really set his mind to his goal (running across the country) and did whatever it took to get through it. He battled MANY injuries throughout the 52 days that it took him to get from San Francisco to New York City. But he dealt with each and every one with dignity even when there were questions of whether or not he could continue. Andy yes, I totally started crying as I watched it. I am obscenely inspired - the most that I have been since reading "Born to Run" on my honeymoon. An ultra is DEFINITELY on my bucket list. How about you? I'm glad you liked the book, I liked it too!